In order to face my fears and enjoy some exciting experiences at the same time, I'm currently taking a whitewater kayaking class here in college. After a couple months of practicing in the pool, March 25 was the day we headed out to the river and tested our skills. It was incredible! Only 2+, maybe 3 size rapids, but they were still a blast to ride. We spent all day on the Tellico River in beautifully scenic Tennessee learning how to surf, eddy, ferry, and stay upright in rapids. Having spent so much time in the pool I have a strong roll, but once I got into the river current it was a whole new experience for me. No longer was I in still water and able to flip or stay upright without effort. It was amazing how fast the current would grab the edge of my boat and flip me over, or, while trying to ferry across, it would grab my nose and flip me around, sending me in the opposite direction of where I was headed. When I got to the waves and holes, there was even more water trying to flip my boat in every possible direction. I was dealing with a force much stronger than I and I had two options: fight it and lose, or learn to use it and thereby conquer it. I remember one hole especially well. I was trying to surf it; eddy alongside it and then ferry right into the middle. The plan was to stay in the wave for a few minutes while surfing, but every single time I got in the middle, the current would grab my boat and flip it around. I tried three or four times before I was finally able to surf it successfully. Some of the larger rapids have horizon lines, making it to where we can't see what we're getting into until we're in it. Of course, these are usually waterfalls or large rapid holes, which are the most exciting and dangerous. Often times I'd watch as the probe (the front kayaker) ahead went to the edge of the rapid, decided on and then signaled which side of the river was best for us to kayak down, and then disappeared. We had to trust him. We couldn't see the rapid, but he could. Then when we came upon the rapid ourselves we'd realize exactly why the probe told us to go where he said. You always have to be on the lookout for obstacles in the river. Many times rocks will catch people unawares, grounding their kayaks momentarily. I ended up doing a 360˚ in the middle of a rapid because my bow got lodged on a rock. Another time I was happily floating down a flat water section. I had just commented on how easy this section of the river was when I suddenly ground to a dead halt, stuck fast on a flat rock lying millimeters below the water's surface. I hastily dislodged myself and then attempted to catch up to the rest of the group who had kept a better eye out for rocks than I had. Something I learned really quickly was that while going through rapids, it is imperative that the kayaker leans forward. 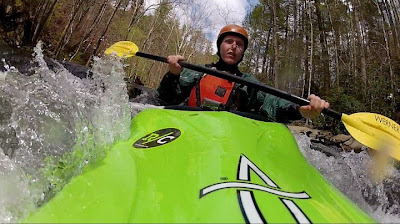 As soon as we lean back in our kayaks, we lose control and are at the mercy of the current and waves. Assuming a forward, ready position, we're able to tackle the waves in style and keep our boat upright. The whole kayaking experience got me thinking about life. Often times our lives seem out of control. Just when we think we've got the basics down, a new situation hits us broadside and flips us around. Life isn't always laid out before us. Often we will come upon horizons which obstruct our view of what lies ahead. Many times we have to be patient in order to find out what our future holds, not knowing what lies ahead until the future has become the present. Many times it's not the huge circumstances, the awful situations, or the worst experiences which trip us up in life. Often it's the little things that we're not paying attention to. The small annoyances that we like to ignore, the little character defects we'd rather not think about. Things are going to happen and life will go on, whether we lean back and don't do anything about it, or whether we lean forward and tackle life aggressively. You can't just go with the flow, sometimes you have to fight the current and assume a determination about life. Always stay flexible; life's current can flip you if you're not paying attention. Follow the Probe over the horizon, as He knows the best route to follow. Don't get distracted by the major obstacles in life and get tripped up by the small ones. Always lean forward with your knees bent - it's imperative.